Hot, sticky and humid weather can wreak havoc on your skin. Here is how to avoid it. Summer season is one of our most favorite times of the year here at PureLx. But as the temperature climbs into unbearable levels, coupled with extreme humidity, our bodies have a lot to contend with. This is especially true for our delicate skin – it’s the first line of defense. Heat expands our pores and causes our skin to lose more moisture through sweating, which leads to dryness and overall dehydration. Believe it or not sweating is actually a good thing! It’s a natural process and a mechanism by which our bodies regulate our core temperature. Beyond that, sweat clears out impurities and toxins. According to Dr. Pina LoGuidice, “…humans sweat glands are known mostly to help regulate temperature by bringing warm moisture to the surface of the skin, which causes cooling as the water evaporates. But the secondary role as detoxifier is not a minor role. Known as the 'third kidney,' your skin has over 2.6 million tiny pores that can help clear as much as 30% of bodily wastes through perspiring. Sweat is composed mostly of water, but also has urea (a breakdown product of proteins the kidneys also discard), and trace metals and minerals. However, problems arise if you let sweat and its aftereffect linger on your skin for some time. As you sweat, the moisture collects all the grime and environmental pollution in addition to the impurities sweated out of your own body. Once all this settles back into your skin it can cause build up in your pores leading to irritation, rashes, acne breakouts, whiteheads and blackheads. start off with a clean face, wear minimal makeup or makeup that will not clog pores, and have face wipes at the ready to wipe your face when you begin sweating. Once you are able to wash your face, wash it off with a good cleansing, moisturizing wash. We recommend our Flower Power Cleanser – the gentle, yet powerful wash made with Rose Hip Seed Oil. And once or twice a week use our Cleanser Micro-Dermabrasion Scrub to cleans deeply within your pores and scour away all the grime, dirt, makeup and dead cells. As mentioned above, acne and blemishes flourish in the conditions created by sweat. All that grime and pollution in addition to the impurities sweated out of your own body will clog your pores. Furthermore, bacteria thrive in heat, combined with clogged pores you have a recipe for rashes, acne and blemish eruption. Solution: Acne prone skin requires constant oversight and care. Be gentle with your skin, don’t over cleanse it as this can backfire, but always keep it clean and NEVER squeeze your pimples! This will spread the bacteria and cause more eruptions. 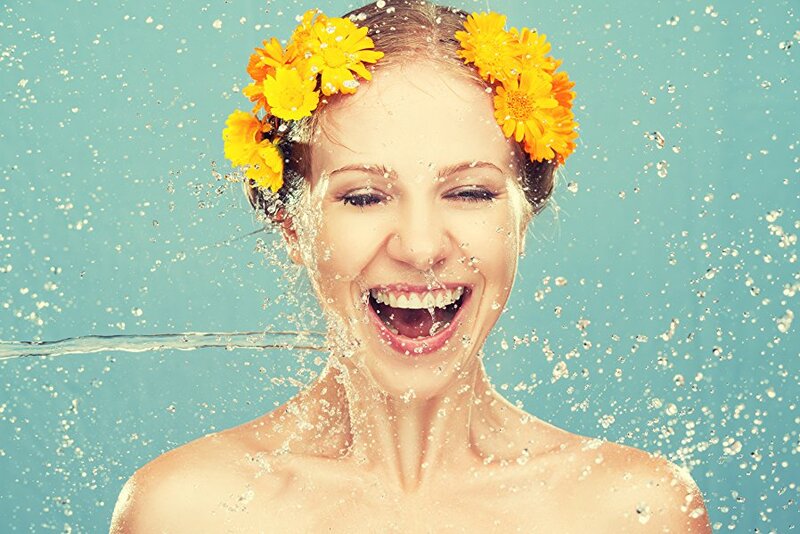 During the hot summer weather, keep clean and gently wash your body and face after sweating. Use wash for both your body and face that’s gentle and will not strip your skin of the essential moisture. For your face especially use face-wash that is ideal for acne prone skin, we recommend our Flower Power Cleanser – the gentle, yet powerful wash made with Rose Hip Seed Oil. If you feel a pimple developing, immediately dab it with our Clear Anti Acne and Blemish Treatment Solution. In fact, at night, after thoroughly washing your face with a cleanser, dab the spot you are most prone to erupt with Clear Acne wand applicator. The concentrated formula will normalize the levels of oil production and stop acne infection by destroying the bacteria that causes it. High temperatures, beating sun and lots of sweating will dehydrate you – both your body and your skin. Potential signs of dehydration are light-headedness, dizziness, fatigue, increased heart rate and breathing, irritability, confusion, no tears when crying, dry brittle skin. Skin that’s dry and irritated is at high risk of getting sunburned. Solution: This is easily avoidable! On sunny, hot and humid days keep drink water and drink throughout the day. Eat fruits and vegetables with high concentration of water – cucumbers, watermelons, melons and pineapples. All of these fruits have high water content and are excellent not just for your internal system but for your skin too, plus they are delicious! Our weather patterns are changing and we’ve been experiencing scorching hot summers and even a short stint under the sun without proper protection can lead to skin burns. It can go from red and irritated skin, to painful blistering and rash. Those with lighter and fair skin complexion and those with sensitive skin are more at risk for burns. wear hats, stay under umbrellas and in the shade, cover as much skin as possible with clothing and apply broad spectrum sun protection on exposed skin and reapply it often, especially if you are working on your tan. To look fabulous and well protected we recommend our Tinted Moisturizer Sunscreen with SPF30. It offers broad spectrum protection from UVA (rays that burn your skin and UVB (rays that age your skin) rays and is rated SPF30! Solution: The only thing you can do is to wash your hands often and thoroughly. Carry hand wipes or hand sanitizer if you aren’t in a place where you can wash your hands. And, try to avoid touching your face with dirty hands.